Owning a home is the American dream. One of the many benefits of homeownership is the ability to customize your property any way you wish—as long as it’s in compliance with local codes, of course. You’ve probably patched and painted your home once or twice, but are you really getting the most out of your property? Take a step outdoors and consider whether your curb appeal needs some work. 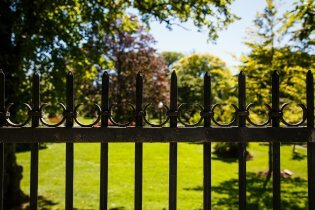 An ornamental iron fence could be what your yard needs to make it stand out from the rest of the neighborhood. If you’re looking to break free from the “sameness” of the properties in your neighborhood, then an iron fence is the perfect choice for you. Ornamental iron can be custom-designed to your preferences. The fencing company will evaluate your property and explain your recommended options for beautifying your property. Your wrought iron fence can be as ornate or simplistic as you prefer. 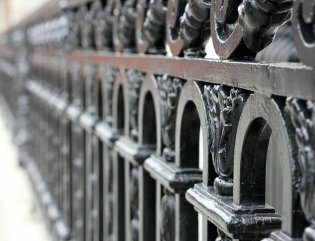 Iron fences usually feature ornate details along the top and sometimes in the middle. Some iron fences are comprised of stylistic designs throughout the entire structure. Any design you choose will instantly evoke the aesthetics of a formal estate or manor home. Nothing beats ornamental iron for durability. The strong metal lasts for generations, and withstands severe weather well. It’s also a practical fencing choice, since little maintenance is required to keep it looking like new. Curb appeal is a point of pride with homeowners. It’s also a matter of finances. The more appealing a home is, the higher a price it will fetch. Even if you aren’t planning to put your home on the market , boosting its curb appeal with beautiful iron fencing will increase its value. When you’re ready to improve your home’s value and curb appeal, give A-1 Fence Inc . a call at (408) 259-2955. Our company is known for elegant fence designs for both residential and commercial properties. We’ll work closely with you to ensure that your wrought iron fence project in San Jose exceeds your expectations. As many homeowners know, having a wrought iron fence in San Jose can increase the curb appeal of a home. A wrought iron fence can add a unique touch to your home, and your garden. 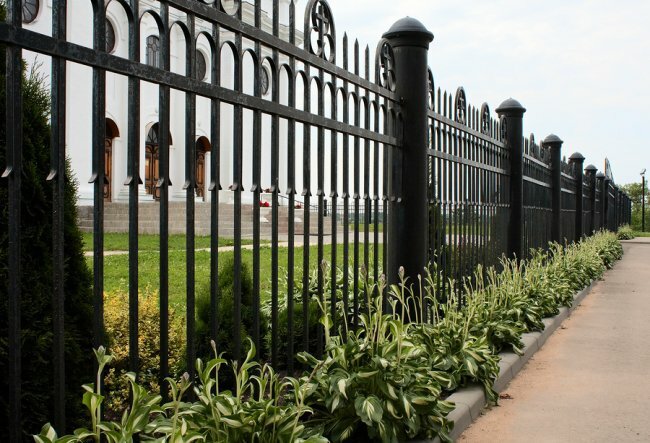 There are some key factors to keep in mind when landscaping around your iron fence. Watch this video for expert tips on landscaping around your wrought iron fence. It is important to design your landscape around your fence. For instance, if your wrought iron fence is large and sturdy, larger trees and shrubs are more ideal. When maintaining your landscaping, it is also a good time to inspect your fence for any needed maintenance. While there are many different types of fencing that you can install around the perimeter of your home, an ornamental iron fence is a great choice for a variety of reasons. The iron fence has been around since the Industrial Revolution and has become a staple of many Victorian style homes. Any home can benefit from an ornamental iron fence in San Jose. Here are some of the advantages of having one. 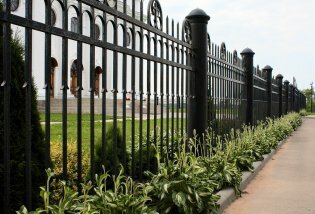 The iron fence has become one of the most popular types of fencing because it is available is so many different styles. You can purchase an iron fence that includes just about any fence designs and, if you’re willing to pay for it, you can even customize one specifically for your home. When you put up an iron fence, you probably won’t have to worry about putting up another fence for as long as you own your home. If you are willing to properly care for and maintain an iron fence, it will last you for many years. Other fences may not hold up well under certain weather conditions, but an iron fence will stand the test of time regardless of the climate. Other types of fences are easy to climb over, cut, or even knock down. Ornamental iron fences are designed to keep intruders out . If security is a concern you have, an iron fence can ease your troubled mind. One advantage of building a wrought iron fence (besides the strength, durability, and beautify of iron) is the fact that you can have virtually any design you can imagine. Look at pre-existing designs for inspiration regarding the post and picket design and placement. You will also need to consider the height and elevation of your wrought iron fence. The only limitations are your budget and your imagination. Watch this video for a look at how to go about designing a wrought iron fence. If you want help designing a beautiful wrought iron fence for your home, consult with a wrought iron fence contractor in San Jose . By working with a fencing company that specializes in iron fences, you will receive expert advice regarding your new custom wrought iron fence. Wrought iron fencing can be used anywhere, from gardens and pools to commercial and even industrial settings. The historic and timeless presence of wrought iron fences makes them a popular choice all around the world. Besides instantly giving your home a highly decorative and ornamental look, wrought iron fencing is also incredibly durable and able to withstand the elements for many years. Iron fences provide exceptional security without hindering your view. Wrought iron fencing should be installed by an experienced fence contractor in San Jose . These fences require precise installation in order to maintain their strength and durability over the years. You can also customize the design of your ornamental wrought iron fence by working with a fence contractor instead of buying pre-fabricated iron fencing. One of the benefits of installing a wrought iron fence is that you can have your fence built to your specific needs. A custom wrought iron fence can help your home stand out and will add a lot of curb appeal to your property. 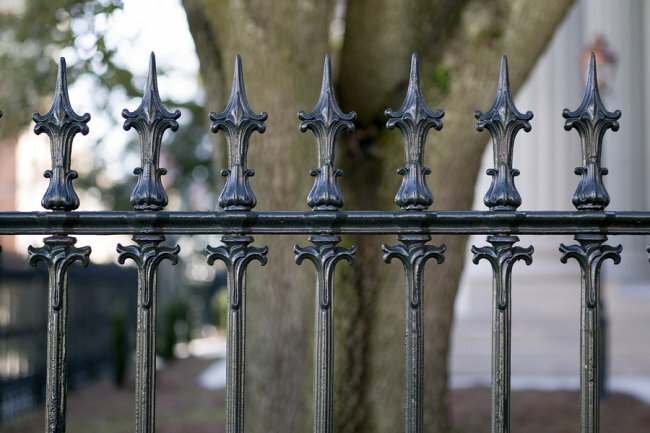 When designing your iron fence patterns, keep in mind local building codes. If you are not familiar with the building codes in your area, your San Jose fence contractor can make sure that your design is acceptable. Watch this video to see an example of what a custom iron fence looks like. If you want to make a statement with a new wrought iron fence, contact a fencing company in San Jose and begin the process of designing your new custom iron fence today. If you are considering building a fence made of ornamental iron in San Jose , A-1 Fence Inc. can design and build the perfect fence for you. Whether your yard is flat, slightly sloped, or significantly sloped, we have the experience and tools to install an attractive and durable fence. Read on to learn more about how we can build an ornamental iron fence on your sloped yard to serve your particular fencing needs. If security and privacy are not as important as simply defining the boundaries of your yard or property, an ornamental iron fence will offer traditional beauty. To build the wrought iron fence so that it can accommodate the slope of the yard, your fence contractors will need to use stair-stepped fence panels or fence panels that can follow the curve of the ground. If your ornamental iron fence needs to keep pets in or wildlife out, then it needs to be built with minimal gaps at the bottom. A contractor will build the fence with rackable fence panels, which follow the contour of the ground and ensure a consistent gap for enhanced security. Iron is an excellent material for this kind of fence, as it gives the rackable panels an open design that is conducive to easy adjustments. A shadowbox design with staggered pickets or lattice design covered with climbing vines will provide the privacy you are looking for in an ornamental iron fence. The fence contractor will step the fence panels so that each panel follows the slope or install custom panels that are adapted to the slope. If you want your ornamental iron fence to function as a freestanding screen or decorative backdrop, the installation process will be straightforward. On a slight slope the fence will be built so that the bottom is parallel with the slope. But on a severe slope, the fence will be installed so that its vertical lines are perfectly straight and perpendicular with the ground. There are many reasons to consider adding a fence to your San Jose home. Fences provide an added level of security from intruders, give you privacy from prying eyes, and can greatly beautify your property. Before you have a fence installed around your home or business, consider what style, design, and materials best suit your needs. Chain link fences are ideal for enclosing a dog run or a sports area, while ornamental iron fences lend an air of elegance and sophistication to any property. No matter which material you think might be best for your fence, you’ll need a reliable and experienced fencing company to install it. Take a look at this infographic from A-1 Fence in San Jose to learn more about fencing materials and what you should look for in a fencing company. Please share with your friends and neighbors! Ornamental iron is a beautiful fencing option that adds timeless style to any residential, commercial, or multi-dwelling property. For a professional installation of iron fences in San Jose , contact A-1 Fence, which has been in business for more than 38 years. Here are the ornamental iron fencing options we offer at A-1 Fence. An ornamental iron fence is a great way to make your home more attractive while boosting its value. Many people also choose iron fencing to keep their pets and their yard safe, as iron fencing is effective at both containing pets and keeping stray animals out. Another common reason why people choose iron fences is to protect their swimming pool from unauthorized users. In fact, any swimming pools installed in San Jose, CA must have fencing that comports with California swimming pool safety laws. No project is too large or too small for our team at A-1 Fence. Since we were founded in 1975, we have designed custom wrought iron fencing for multi-dwelling properties such as apartments, condominiums, assisted living housing, and neighborhood pools. Ornamental iron will contribute classic style to your multi-dwelling building. Furthermore, iron fencing is stronger and more durable than vinyl or wood. As long as the wrought iron is painted regularly, it will continue to look attractive for years to come. At A-1 Fence we have manufactured custom metal fence designs for a range of businesses, commercial contractors, and their clients. Our ornamental iron looks great, is easy to maintain, and adds security to any building. 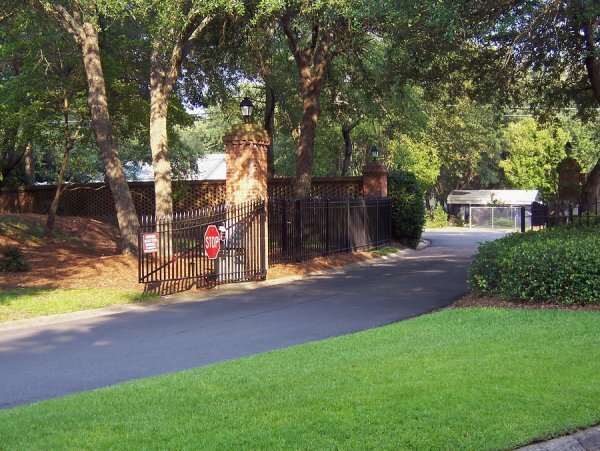 We can even make hydraulic and mechanical automatic driveway gates that open—either by sliding or swinging—with a wireless transmitter or a manual device. If you opt for a gate opener, we can fit it with energy-efficient, low voltage solar panels to ensure that the gate works during a loss of electricity. We can make a gate that either slides or closes.